Security services provider Integrals is hoping swanky new London premises at 30 St Mary Axe - also known as the Gherkin - will up its standing among potential clients after cutting the ribbon on its new City pad in the RIBA Stirling prize-winning skyscraper today. 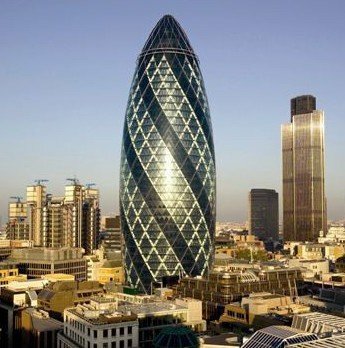 Security services provider Integralis is hoping swanky new London premises at 30 St Mary Axe - also known as the Gherkin - will up its standing among potential clients after cutting the ribbon on its new City pad in the RIBA Stirling prize-winning skyscraper today. The distinctive 591 foot, 40 floor tower, will now be home to Integralis' sales and consulting teams as well as saving visiting employees from having to trek out to Reading. "Moving our offices to the Gherkin positions us to further develop or client base and continue our excellent relationships with existing customers," said sales and marketing director Neal Lillywhite. "The Gherkin is a great location for us; within a stone's throw of many of our clients, it offers us the ideal combination of location, scale and security that we are looking for," he added.